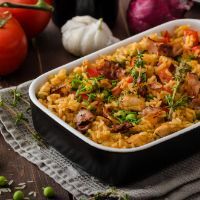 Nothing tastes homier than this hearty dish similar to paella. Place a heavy-bottomed skillet over medium-high heat and add olive oil. When warm, add chicken and sprinkle with salt. Brown chicken and transfer to large ovenproof baking dish. Brown chorizo in same skillet and then add to baking dish; mix chicken and chorizo. Layer half of the rice over the chicken-chorizo mixture. In same skillet, sauté garlic, onion, and bell pepper until softened. Spoon vegetables over rice in baking dish, and top with remaining rice. In a bowl, mix together saffron and chicken stock and pour over rice. Top with chopped tomatoes. Cover tightly with aluminum foil and cook for 1 ½ hours, longer if needed. Garnish with peas and pimento strips and serve.